Welcome to the Flying Eagle Bed & Breakfast! 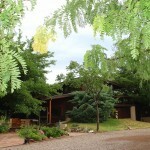 With it’s panoramic view of Arizona’s beautiful Verde Valley and the red rocks of Sedona, the Flying Eagle Country Bed & Breakfast awaits you. The Flying Eagle Country Bed & Breakfast is surrounded by native landscaping and is frequently visited by native wildlife, including coyote, javelina, deer, fox, and a variety of birds (cardinals, quail, ravens, hawks, etc.). The convenient continental breakfast will get each day off to a wonderful start.